Finally, a Surface Pro with great battery life. The Surface Pro is everything we've ever wanted from Microsoft's Surface line. It fixes the few remaining problems from the Surface Pro 4, a machine that I adored. And yet it's far less exciting than its predecessors. 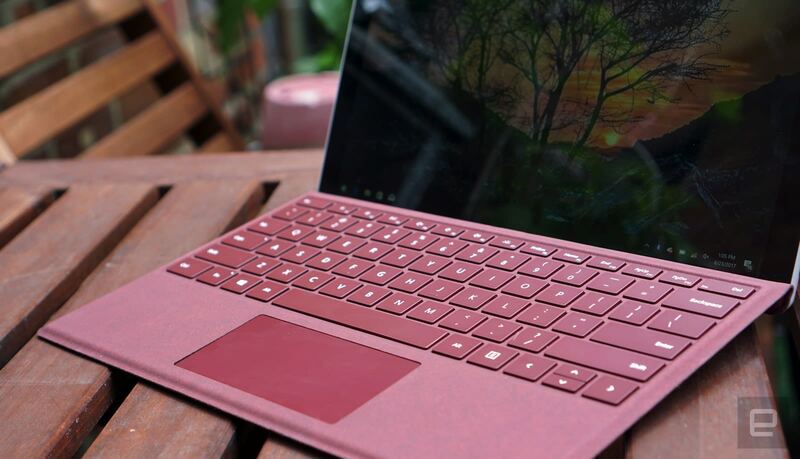 It's the second incremental upgrade since the Surface Pro 3, and while there's something to be said for sticking with a solid design, in a way it feels like we've seen all of this before. Given that it's been a year and a half since the launch of the Surface Pro 4, I expected more. 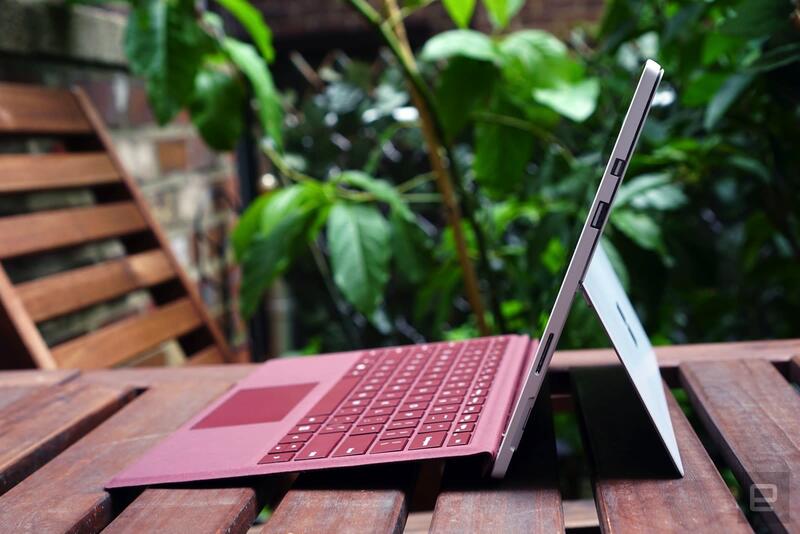 The Surface Pro is the most refined Surface device yet. It retains everything we loved about the Surface Pro 4, while fixing the nagging battery life issue. But it’s mostly an iterative update, without any major design leaps. Be the first to review the Surface Pro (2017)? The Surface Pro doesn't look significantly different from the previous two models, even though a lot has changed under the hood. 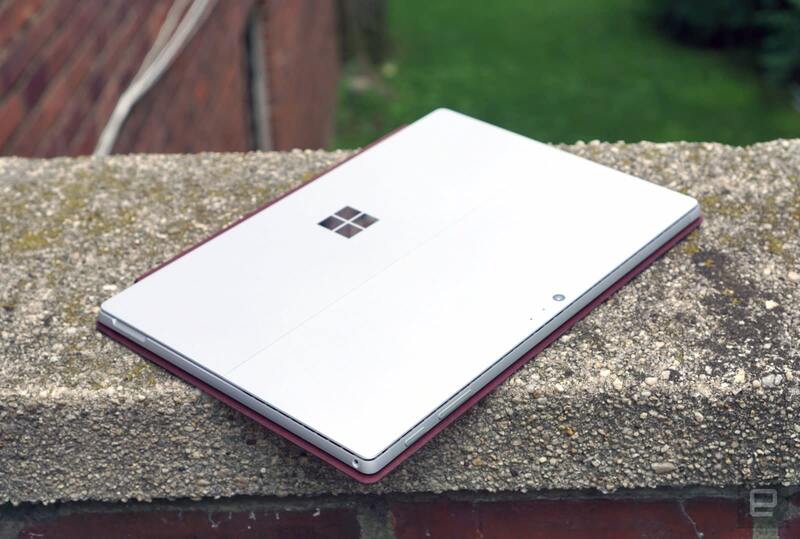 That's not a bad thing: The slim metallic case is still pretty attractive, and Microsoft has rounded out the device's edges a bit so that it's more comfortable to hold. 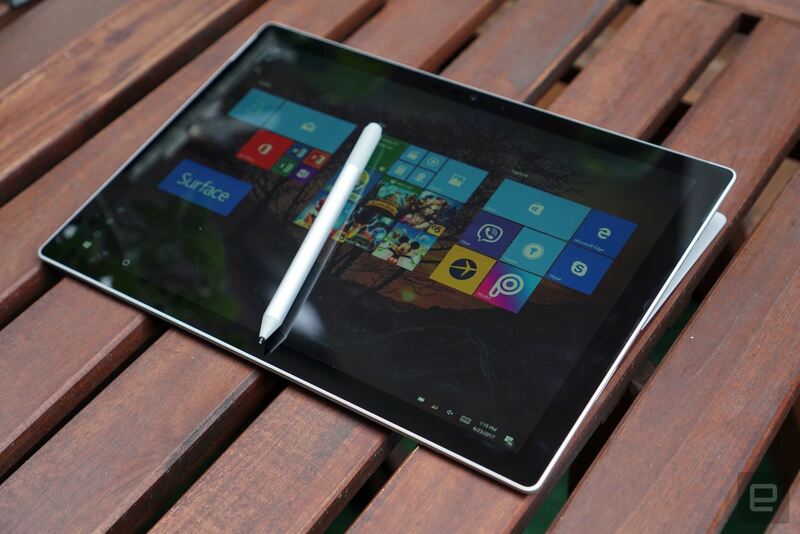 Every configuration of the Surface Pro weighs around 1.7 pounds, which is a bit hefty for a tablet. The keyboard adds another 0.68 pounds, bringing the total weight of a fully assembled Surface Pro to around 2.4 pounds. Notably, the Core i5 model is a bit lighter than before, thanks to an ingenious fanless design. The iconic kickstand is once again a key feature for the Surface Pro, and now it can be lowered even further to 165 degrees. Microsoft calls this orientation "studio mode," as it's ideal for digital artists to use for drawing. And, of course, it's also reminiscent of its unique Surface Studio all-in-one PC, which also has a screen that tilts into an easel-like angle. The kickstand's hinge looks a bit different than the Pro 4's, but it otherwise works the same. Opening and closing the kickstand is as smooth as ever, and I grew to enjoy using the studio mode for doodles. 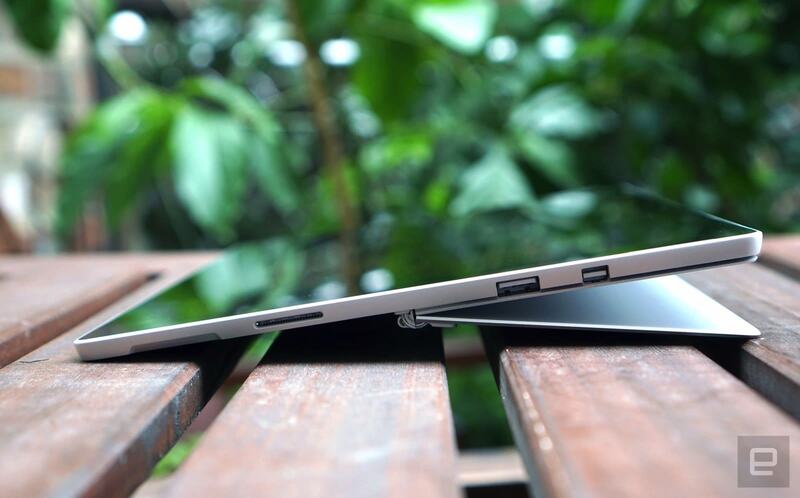 If you haven't used a Surface before, the Pro's kickstand might take some getting used to. It's easy enough to use on a flat table -- just pull it out and find the ideal angle for the screen -- but it's trickier to orient on your lap. That's particularly true if you're resting it against your bare legs, as the kickstand's edge tends to dig into your skin after a while. It's not impossible to use it on your lap, though. I had no problem writing most of this review while sitting with the Surface Pro on an uncomfortable park bench. When it comes to ports, not much has changed. There's only a single USB 3.0 jack, MiniDisplayport, a microSD card slot tucked underneath the kickstand, a headphone jack and the power connection. Just like with the Surface Laptop, it's disappointing to see Microsoft skip on USB-C, which would make its machines more versatile and easier to charge. You may have noticed a recurring theme so far: a distinct lack of change. While it's nice to see more refinement in the Surface Pro line, it's beginning to feel a bit stagnant. It's 2017, it would be nice to see Microsoft try for thinner screen bezels, which is all the rage on Dell's XPS line and the newer iPad Pro, or add in some completely new functionality. Once again, the Surface Pro packs in a gorgeous 12.3-inch screen with a sharp 2,736-by-1,834-pixel resolution, which translates to a pixel density of 267 ppi. That's on par with what Apple would call a "Retina" display, which means it's ideal for high-resolution photos, as well as for making text look extra smooth. It's also a great screen for video, though you'll have to live with black bars on the screen due to its 3:2 aspect ratio. The Surface Pro's screen manages to look bright and bold no matter what you throw at it. And while it's a bit reflective, like most tablet screens, you can still make out what's on the screen in direct sunlight. It's also a reminder of why Microsoft has stuck with the 3:2 aspect ratio, whereas most other devices opt for 16:9 widescreen these days. Having much more vertical screen space is simply very useful when it comes to browsing the web and using productivity apps. While the Surface Pro is technically a tablet on its own, it transforms into a full laptop with its keyboard accessories. The new cloth-like Alcantara keyboard feels slightly improved from the last model, with a satisfying amount of depth to every key press. Their touchpads are incredibly smooth and responsive as well. Unfortunately, the keyboards are still sold separately for $130, and you'll have to shell out $160 if you want the more premium Alcantara covering. 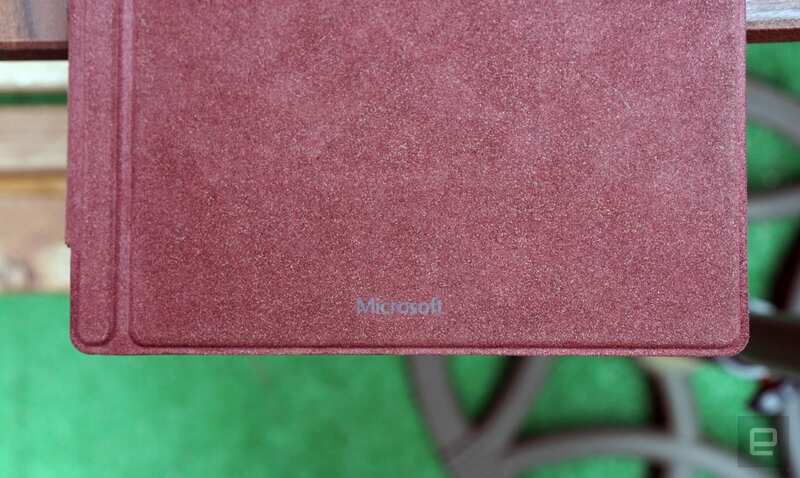 The latter is something we also saw on the Surface Laptop, and while it might seem like a mistake to put cloth right beside your keyboard, I had no problem cleaning off mild stains with a damp cloth. It's less clear how it'll last in the long term, though. 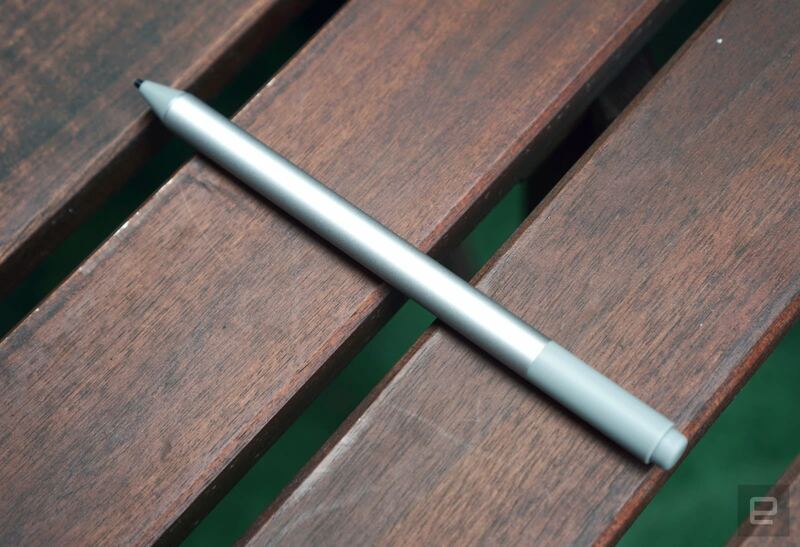 While Microsoft unveiled a new pen to go alongside the Surface Pro, it's no longer included in the box. Even worse, it's more expensive than the last model at $100. At least you're getting a decent upgrade for your money. It features 4,096 levels of pressure sensitivity -- twice as much as before -- and it's even more useful for artists, since you can tilt it to the side to shade your drawings. Most importantly, the revamped Pen simply feels better to use. It's a lot more like putting pen to paper and has just the right amount of resistance. I'm not much of an artist, so I can't speak to its illustrative capabilities. But I grew to appreciate the Pen's smooth writing performance for jotting down quick notes. Of course, for $100, you should make sure you'll use it for more than just that. The Surface Pro packs in Intel's seventh-generation CPUs, which, in addition to being faster than the last model, also add new features like hardware 4K video decoding. And, as I mentioned before, the mid-range Core i5 model is now fanless, like the entry-level Core M3 variant. Not only does that make it a bit lighter, it's also completely silent even when it's being stressed. That's a pretty big deal, since that Core i5 chip is a full-fledged dual core CPU, not an underpowered processor like some other fanless designs. Performance-wise, the Surface Pro is on par with most other ultraportables, including the Surface Laptop. It never felt like I was settling for a lesser experience, which is more than I can say for the iPad Pro or any Android hybrid tablets. Since it runs Windows 10 Pro, you can install any Windows application, and it'll run just just fine. It kept up with my daily workflow, which typically involves having dozens of browser tabs open, along with photo editing apps, Spotify and Evernote. Since it's relying on integrated graphics, don't expect to play any heavy-duty games, though. While the Surface Pro is a bit heavier than a typical tablet, it's still comfortable to use for reading comics and ebooks. And it does a far better job at disappearing into your bag than most ultraportables. Versatility has always been Microsoft's goal with the Surface Line, and this is clearly the company's most successful entry yet. The biggest improvement this time around is in battery life. While the Pro 4 lasted for 7 hours and 15 minutes during our battery test, which put it on the low-end for ultraportables, the Surface Pro kept going for 13 hours and 40 minutes. And when it comes to more real-world usage, it typically had around 20 percent of battery life left after a full work day. Now it's in a class of notebooks, like the MacBook Air and Surface Laptop, that I can take anywhere without worrying about carrying a charger. The Surface Pro starts at $799 with a Core M3 processor, 4GB of RAM and 128GB of storage. These days, that's just downright paltry. If you were going to get one, I'd suggest saving up for the $1,299 Core i5 model with 8GB of RAM and a 256GB SSD. Yes, that's a lot of money, especially when you add $100 for the Pen and another $130 (or $160!) for a keyboard. The pricing makes a bit more sense when compared directly to laptops -- but laptops also come with keyboards. You can do better, Microsoft. I've long argued that Microsoft should be bundling keyboards with the Surface Pros, but this year it's taking a step even further backward by making the Pen an additional purchase. Simply put, this is a mistake. Other companies are quickly improving their own hybrid laptop/tablet designs, like Lenovo's Thinkpad X1 Tablet and HP's Spectre X2, and it won't be long before they surpass the Surface Pro in terms of features and ingenuity. It's possible that Microsoft isn't being aggressive with the Surface Pro's pricing because it wants the wider hybrid PC market to thrive. They're all running Windows, and still an essential part of Microsoft's ecosystem. So with the Surface, rather than aiming to crush its competitors, Microsoft has to to balance its own success with supporting other PC makers as well. With all of its improvements, the Surface Pro sits atop the heap of hybrid laptops out there. But I can't help but feel like Microsoft missed an opportunity to show the competition how it's done. It's pricier than it needs to be, and it doesn't make any design leaps over previous generations.